'Doc H.' House, Historic District of Grapevine,1 Block to Main Street. This super cool and eclectic house is clean, cozy, stylish two bedroom, one full bath, large kitchen and den that offers all modern conveniences of home. Take a trip back in time while sleeping in comfortable beds and watching your favorite movies on the 32' LCD TV, or surf the internet with blazing fast fiber. A HGTV Designer provided most of the furnishings and colors in this house. The bathroom is brand new and offers a walk in shower. The bathroom is period correct with the tile work and white granite counter top. Wall attached hair dryer provided. 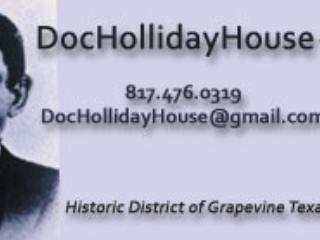 Guests in the 'Doc H.' house are just one block from Main Street, literally around the corner from Esparza's, and two houses from one of Grapevine’s many Wine Tasting rooms. Play it safe by not driving or walking long distances after enjoying your days at many Wineries, Festivals, and award winning restaurants along Main Street. Rental from Richard/mary Ann H.